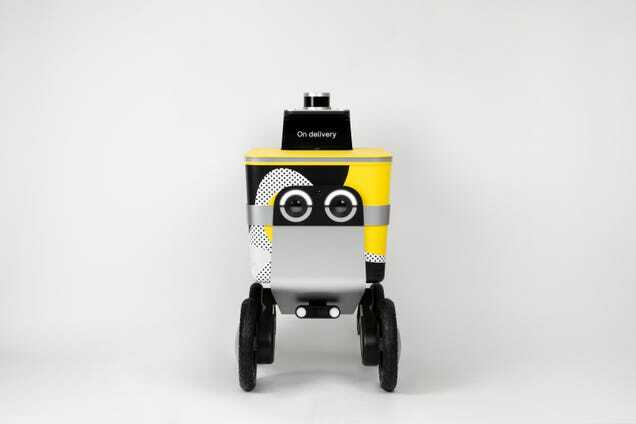 Robotic couriers that look a whole lot like Minions could be coming to American cities next year. Last week, the US delivery service Postmates announced its plans for a fleet of semi-autonomous messengers that the company wants to deploy in some cities in America in 2019. Postmates designed the vehicle itself, and dubbed it Serve. The storage-cooler rover is supposed to to carry 50-pound loads and travel 30 miles on a single charge. Once it arrives at its destination, users will apparently be able to unlock the lid with their phones. Or the bot could deliver food to a certain spot and pass it off to a human deliverer. Serve relies on Lidar as it navigates its course, but it also comes with a camera that is supposed to be monitored by a human driver who will oversee a team of Minions Serves. TechCrunch reports that Postmates built it to be partially guided by a person, and included turn signals and programmed it to yield to others, in part because San Francisco banned delivery robots in most areas last year. Postmates told TechCrunch it is collaborating with the San Francisco board of supervisors to create a system for regulating and issuing permits for limited robo-deliveries. The city voted in favour of the ban largely because many people don’t like rovers taking up the pavements. There’s already a growing unease about automation, but people seem to get especially angry about robots taking up their space. Take, for instance, the recent wave of vandalism and threats against Waymo’s self-driving vehicles in the US state of Arizona. That makes us curious if Postmates also intentionally designed Serve to be friendly looking. After all, how could you get angry at those eyes? They look like they’d well up with tears if you tried to kick it—or steal from it. They’re right—Minion appeal is universal.